How can one create a work item in a follow up action? How to link such a work item to the work item that was just saved? If you are interested in some more details using the work item server API continue reading. These are questions that come up often in the Jazz Forum. There are several answers already in the forum, but I did never take the time to publish anything here. Lets change that now. Which API’s are available in the server SDK and which should I use? is an important common API for work item manipulation. which is is an important server API for work item manipulation. It is important to note, that the common API is also available in the client SDK. This is important, because the common API can then be used in client code as well as in server extensions. The client SDK and the Plain Java Client Libraries package the common API and also provide a client API. The client API usually is in packages named with *.client. * in the namespace. Like the in the pattern above the interface names often have a postfix Client in the name. is available in the server SDK/API as well as in the client SDK/API and an important common API for work item manipulation. is only available in the client SDK and the Plain Java Client Libraries. This pattern repeats across the available APIs. The specific client and server interfaces like IWorkItemServer and IWorkItemClient just add a few very specific client side capabilities. If you can, you should use the common API and prefer it over the more specific ones. That way it is possible to use a lot of code in both contexts. Unfortunately I became aware of the importance of this too late and a lot of the example code on this blog uses the more specific client and server interfaces. So look at the examples and always check if there is a common interface you could use. Fall back to the client or server related API if the common API does not have what is needed. In the client API it is possible to use the class com.ibm.team.workitem.client.WorkItemOperation which deals with error handling. As we have learned in the paragraph before, this is client only API and not available in the server API. To create the work item on the server, you have to use IWorkItemServer.createWorkItem2(), then set the attributes and finally use IWorkItemServer.saveWorkItem3(), IWorkItemServer.saveWorkItem2() or IWorkItemServer.saveWorkItems() to save the work item(s). Which one you use depends on what needs to be saved. Please note, that rules apply in the server as well. Required attributes will be required and need to be provided to be able to save. The server operation runs in a context with specific privileges and it has only the permissions provide by the user context. I wanted to post that for a long time, finally I was able to take the time. I hope this helps someone out there starting with extending and automating RTC. I always wanted to look into asynchronous tasks and also in creating events and e-mails on the server. Especially mail notification is a popular request on the forum. So here a working example. This is not all my work, it is based on the QueryDev Guide in the the Jazz Developer Wiki and on Jorge Diaz’ blog post “RTC Custom Scheduled Async Task example explained”. I was looking into these sources, but I found the QueryDev Guide did not ship a complete example – it was the basic classes. Jorge ships the extension, but both examples don’t compile with the RTC 6.x versions of RTC and potentially earlier versions. As mentioned in the QueryDev Guide the feed category used there is no longer available and in both posts one of the API methods used is missing a parameter. This one of the few examples where I have actually seen minor changes in the API so far. This gave me enough reasons to look into creating a working example again, to refine it and to try to better understand what the extension does and how. Jorge has an additional post around asynchronous tasks. See Custom Services Configuration Properties – naming collision issues for additional hints. You can download the project source code from here. The code implements an asynchronous task that is deployed on the server and uses a query to find work items that are overdue and not closed, in any project area. It creates a notification for these work items. The solution runs in two configurable modes. Mode “event” is the default. In this mode the asynchronous task creates a Message At Me event in the server feed using the IWorkItemFeedConstants.MESSAGES_AT_ME_FEED_CATEGORY. This event also triggers E-Mail notification for the owner. The Event is only created if there is no related MESSAGES_AT_ME_FEED_CATEGORY event that has been created in a configurable time span. This prevents from flooding the events and the user e-mail from duplicates. Mode “mail” can be configured. This mode sends a dedicated mail to the owner of the work item. This mode can not detect if it has recently sent a mail to the user. This means the asynchronous task should run with a delay that prevents it from running multiple times a day to avoid spamming the mail folders. It would also be worthwhile to look into a way to schedule the task only at a certain time of the day. The reason why the second mode was added is two fold. I wanted to have an example how to send an e-mail with the server API. “You were mentioned in work item ’52: This is a test work item’ [s]”. You can see the example message below. Althought he message body mentions its cause, this message is not really specific in its topic and I rather wanted something more specific. I tested several different event categories, including a custom one, but the results where even worse. For example, the message body did not even contain the event description “The work item was due 6 weeks 3 days 4 hours ago”. The custom message sent in the second mode looks like this. Since this is only an example, you might want to think about how to avoid sending multiple e-mails e.g. somehow storing information when a message was sent to whom and for which work item somewhere. I tried if I could create an event, that would not trigger an e-mail to store the information, but that did not work for me. You probably don’t want to run your tests against the company mail server. To be able to test and debug the extension, it is better to install a test server. The same probably applies to the business mail client, so consider to install a test mail client. There are various free mail servers and mail clients available out there. I used hMailServer as mail server on Windows for my testing. I used Mozilla Thunderbird as mail client for testing. Set up the mail server and create user mail accounts to be used for testing. Then make sure to be able to to connect the mail client to the mail server and send mails back and forth. This provides all the information needed to set up RTC for mail notification. 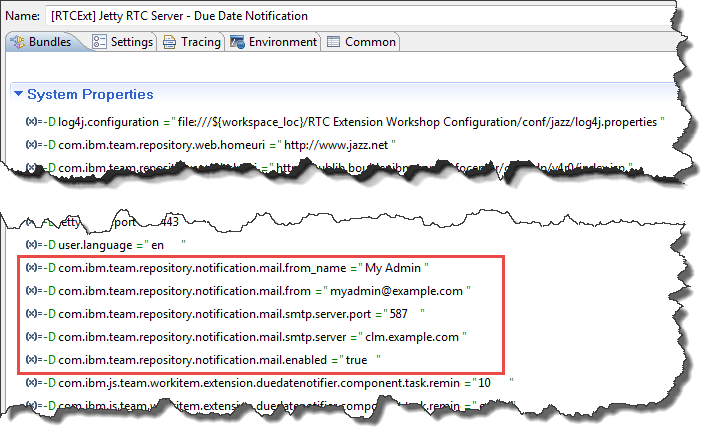 To verify the required settings needed for the RTC/JTS server, enable e-mail notification on the development server (the one that is installed in the folder C:\RTCxxDev\installs\JazzTeamServer). Start the development server, if it is not already running. Open the JTS setup page https://localhost:9443/jts/setup. Proceed to the step Configure E-mail Notification. 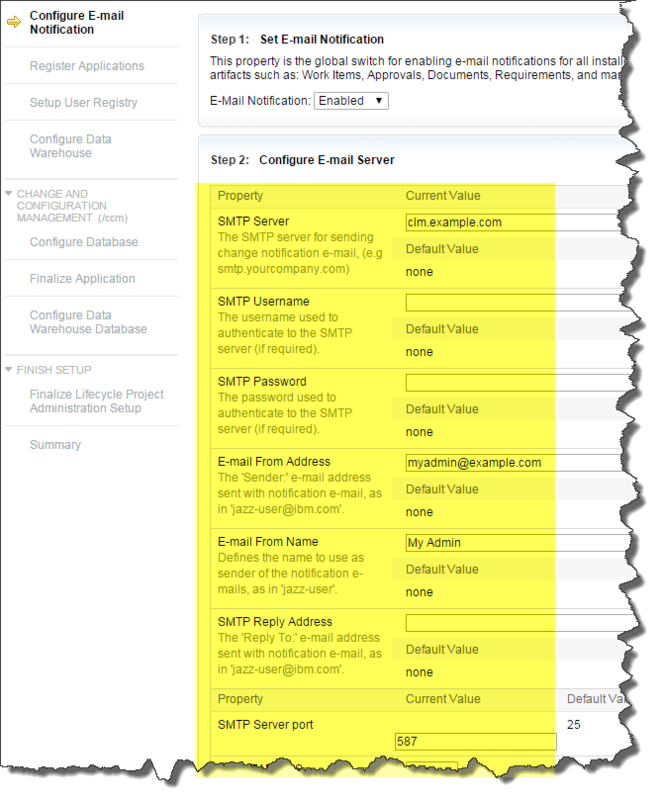 Enter the values needed to configure the development test server to enable mail notification. Test the connection. The page should look similar to the one below with different values. Note that you can use domain names or configure IP aliases in your hosts file to avoid using localhost as the server address. Create test users with e-mail accounts matching your test accounts on the test mail server. Send test e-mails e.g. invitations for a user to make sure everything works. Note that there is a delay in the server, you would have to wait a while to receive the e-mail. Check the JTS server log for any errors with respect to mail sending if needed. If this is working, open the JTS teamserver.properties file in C:\RTCxxDev\installs\JazzTeamServer\server\conf\jts to locate the values that were added. The values corresponding to the setup above are shown below. The entries should all start with the prefix com.ibm.team.repository.notification. The best option to locate the values is to search for that prefix, as the properties are not saved in an alphabetic order and will be spread across the file. Copy the entries into some text editor, as the are needed to set up and enable e-mail notification in the Jetty server debug launch. 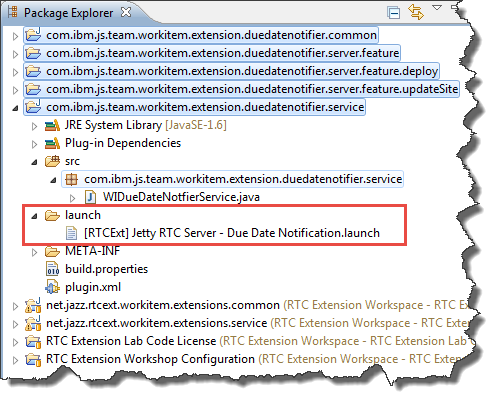 For debugging it is important to enable e-mail notification in the Jetty debug server. So it is necessary to provide the inforation above to enable the notification. 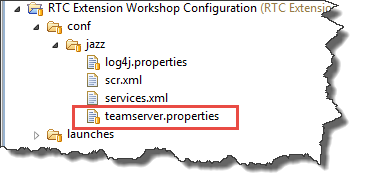 The Jetty launch files in the Rational Team Concert Extensions Workshop have a teamserver.property file located in the project RTC Extension Workshop Configuration in the subfolder jazz. It would be possible to use this file to pass the special configuration parameters. But the file would be shared between all the launches that are configured this way. As an alternative, it is possible to specify properties in the launch itself. This makes it possible to have various different launches that manage the different setups. 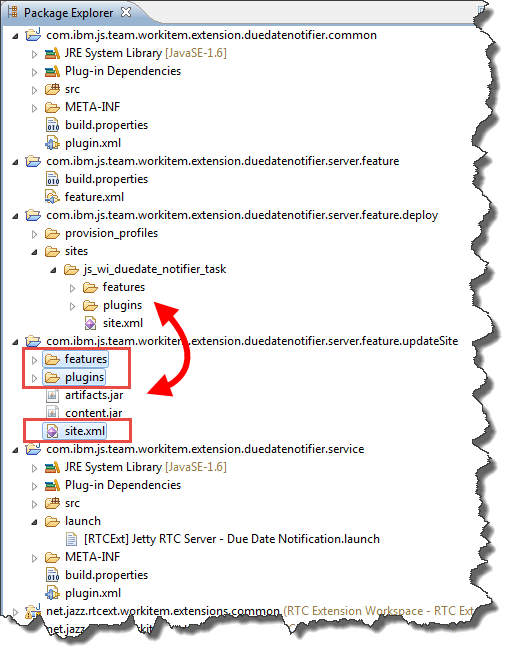 Since a launch file can be stored in a project related to the extension itself, this is a way better option and also allows to share the launch in SCM and keep the RTC Extension Workshop Configuration on default values. This is the approach used here. To configure e-mail notification and other properties, create your own Jetty launch, by copying and giving it a reasonable name. Then add the properties needed to the System Properties of the Jetty Launch. The next image shows such settings. Use the common tab of the launch to change the save location and save it in one of your extension projects. To be able to test and debug an asynchronous task, you want to be able to run the task more frequently as in a typical deployment. To avoid having an unrealistic default setting for the frequency of the task in the production environment, it must be avoided to set the default to a high frequency. This can be solved by configuring the task frequency by adding a configuration property in the same place that was used above. The special property to change the delay between running the asynchronous task is basically the property that the server would save in the teamserver.properties if the task default would be overwritten. The ID of the property depends on the ID of the Jazz component defined in the task and on the name of the property. The name of the property is task.remind.fixedDelay. In the image below, the value is set to 10 so that the tasks is run every 10 seconds. As shown in the image above there are other parameters for the asynchronous task that can be overwritten for testing in a similar way. The mail task also does not run very often and for debugging it would be convenient if it runs more frequently. This can be fixed similar to above. The parameter com.ibm.team.workitem.notification.mail.fixedDelay=15 at the end of the list in the above image is used to set the mailer mail sending frequency to 15 seconds, to avoid to have to wait 10 minutes or whatever the default is until the messages are actually sent. A launch with these settings is shipped as part of the code. You have to change the e-mail settings for your setup to make it work though. The documentation in the QueryDev Guide in the the Jazz Developer Wiki is still valid for the code that can be downloaded from this post. There are some few changes that were done. 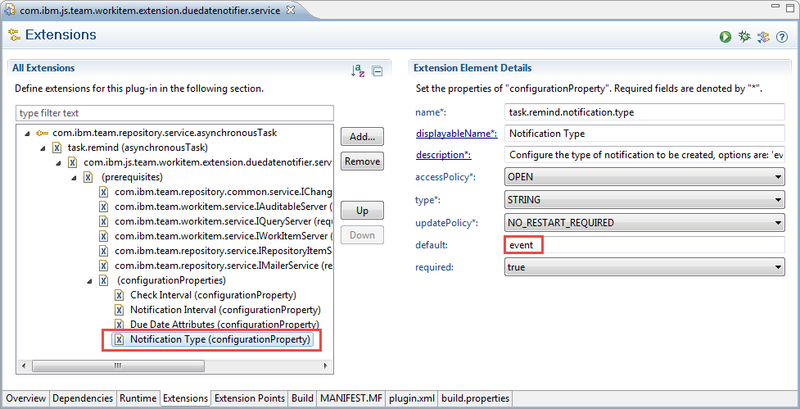 A new configuration property with name task.remind.notification.type was introduced as shown below. The new capability to send a special e-mail was introduced based on Jorge Diaz’ blog post “RTC Custom Scheduled Async Task example explained”. To support sending e-mails additional prerequisites where added to the Extension as well. There is some more documentation added in the code. In the method runTask() a decision is taken to create events or to send a special e-mail, based on the configuration. 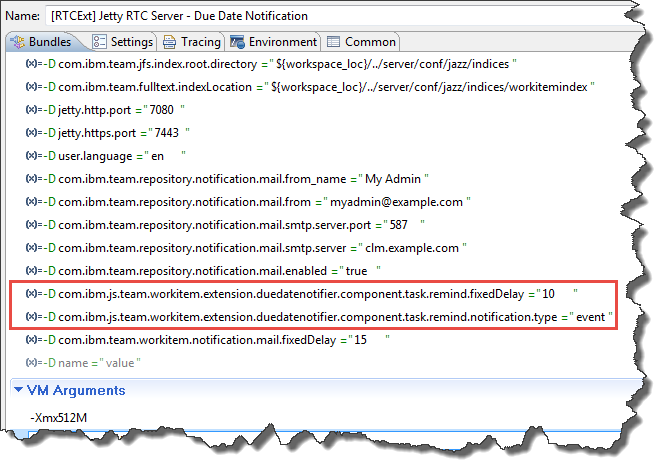 The code that implements sending the e-mail in Jorge Diaz’ blog post “RTC Custom Scheduled Async Task example explained” is shown below. Jorge’s code was changed to be able to show the URL of the work item in the e-mail. It also does not send mail to the owner if there is no owner (the owner has the ID unassigned). This might be language dependent. I did not find a great way to get the unassigned user. Please leave better ways to do this in a comment, if you come across one. It would be possible to send the e-mail to some other account in case it has no owner. It would be possible to search for a user with a certain role such as ‘Project Manager’ and make sure that the task is not forgotten. * Creates a custom notification mail to the owner. // You might want to do something, e.g. annoy someone else. The below code creates the message. * Create an e-mail and send it around. attributeSuffix = " for work item attribute: "
String mailSummary = "'" + workItem.getId() + ": "
The interesting part is to create the URL for the work item. It uses the class Location to get the URI (URL) created. It is important to note that the example uses a named location. The related method namedLocation() is used to create the Location. There are different types of locations and the URIs that are created are slightly different dependent of the location type. In some contexts it is important to use the correct location. One example is in creating links between artifacts of different applications such as requirements and test artifacts. Using the wrong location type will cause problems. In this case converting the location to a string creates the link to open the work item we want to be available in the mail. The structure of the projects that are used to ship is similar to all the recent examples posted on this blog. To build and deploy the task, open the site.xml in tha update site project and run Build All. Then copy the site.xml file and the folders features and plugins into the folder sites/js_wi_duedate_notifier_task in the deploy project. Once this is done, it is possible to copy and paste the whole content of the deploy project into the configuration folder server/conf/ccm and accept any overwrites. The image below shows the first part. See the post Is The Extension Deployed? How Can I Redeploy? to understand how to reset the server to enforce deploying the new extension. Note, all projects are set up to ignore the files that don’t need to be under version control in RTC. 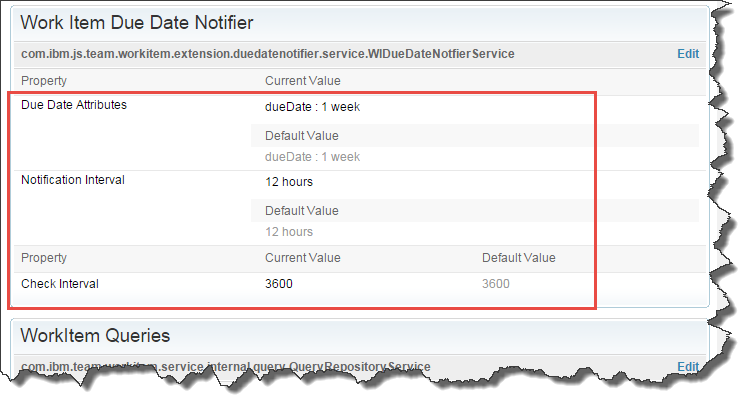 The Due Date Notifier Asynchronous Task can be configured in the advanced properties of the CCM server it is deployed. Going from just Rational Team Concert to a full Collaborative Application Lifecycle Management Solution introduces URI based link types. This post answers this forum question about how to follow URI based references to work items. *Update* The post A RTC WorkItem Command Line Version 2 contains downloadable code that performs most of the activities required for reading and modifying work items, including the creation of all kinds of links. The interesting code can be found in the com.ibm.js.team.workitem.commandline.helper package in the class WorkItemHelper. All techniques described below are used there. With respect to links, the code shows which kinds of different location types are used. I updated the post The RTC WorkItem Client Link API – Linking to Work Items and Other Elements and added client API code to analyze the references for a work item, including URI based links. The code can be reused in server extensions as well, except for the method analyzeReferenceTarget(). The post The RTC WorkItem Server Link API – Linking to Work Items and Other Elements needed to be updated as well, with server specific code for analyzeReferenceTarget(). If you work on a server extension, get the client code from The RTC WorkItem Client Link API – Linking to Work Items and Other Elements and replace analyzeReferenceTarget() with the code for the server from The RTC WorkItem Server Link API – Linking to Work Items and Other Elements. As always, license statements in the posts apply to the code and remember that this code comes with the usual lack of promise or guarantee. Enjoy! I am helping users with questions in the forum for quite some time now. One area where a lot of questions come up is around the API and how to extend Rational Team Concert. One very popular question, and really asked a lot recently, is how to update a parent or child work item when saving a work item. Since this comes up so often and I can’t find the example I believe I once found on the Jazz Wiki anymore, I wrote my own code and I intent to show it in this post. *Update* I published a slightly enhanced version of the code presented below in the post Resolve Parent If All Children Are Resolved Participant. You can download the code here and it contains this example as well. The task is simple: when a work item gets saved, we want to update the estimates, correction and time spent on the parent work item based on the accumulated data of all its children. Rational Team Concert supports this by creating a so called Participant. The Participant is one or more Eclipse plug-ins that are extending the extension point com.ibm.team.process.service.operationParticipants for, in this case, the operation ID com.ibm.team.workitem.operation.workItemSave. You can find a list of extension points and operation ID’s here in the Jazz Wiki. The Rational Team Concert 4.0 Extensions Workshop shows all the steps required to create a complete participant also sometimes called a follow up action. Please note that all code below is for a Server extension. Client extensions would use client libraries that have similar names. The following picture shows the data on the work item that we are interested in. *Update* A participant or follow up action works after the fact of saving. RTC also supports preconditions or Advisors. Start here if you are looking into doing something like this. Lets look at the initial code. The explanation follows. // First check that the operation was a 'save' and get he operation data. What the code does is essentially, get the parameters and check if it is responsible for this operation. If this is the case it checks if a parent exists, retrieves it, and then tries to update the parent from its children. It tries to decide as fast as possible if it has to run. The reason is that it would block a user interface operation longer than necessary if it does too much work. It would be possible to add additional checks. For example it would make sense if the save has changes to the attributes we are interested in. The checks contain code that is commented out to be able to avoid recursive calls of the participant. The details are described in the section Save The Parent. * @return a work item handle of the parent or null if a parent does not exist. The code basically gets the parent references of the new state of the work item that is being saved and returns it if one exists. * Update the parent from the estimation data of its children. // We want to modify the parent, so get a working copy. // Save the work item with an information that could be used to prevent recursive ascent. This code does a lot. First it gets the full state of the parent. We need the parent as a work item to be able to get the attributes we are interested in and we need the latest state so that the work item can be edited at all. Then the code looks up the attributes for Time Spent/Time Remaining and the Corrected Estimate, using the attribute ID’s. The code then iterates the references of the parent to find the child work items. For each child it looks up the values of the attributes we are interested in and adds the data up, if there is a value. The value -1 indicates the attribute is uninitialized. The last steps are to get a working copy of the parent work item so that it can be modified. Then the calculated values are set. Finally the work item is saved. The saveWorkItem3() operation takes an additional parameter, a set of strings. This can be used to detect that a subsequent trigger of the participant was caused by this save operation. The following code inserted into the run() operation would allow to prevent this from happening, e.g. to prevent that the parent’s save causes another roll up. The code updates the parent work item. This will cause a workitem save operation and also trigger the associated advisors and follow up actions including this one. The saving of the parent will cause this participant to run and update its parent and so forth. There are cases, where this is OK, like in this case. But there are other cases where this can cause issues like loops and the like. Loops or endless recursions can cause your server to crash, so you need to prevent this from happening. This is what the code below can be used for. This code looks at additional parameters – basically strings. If some expected string is present the operation finishes. The additional parameter is provided when saving the work item already in the code above. There is still some code missing, that gets the value of the attributes for Time Spent and the Corrected Estimate. If there is no data we return 0 so that we don’t break anything. Now the participant’s code is finished. You would have to create the plugin and a component as described in the Rational Team Concert 4.0 Extensions Workshop to deploy it. The plugin.xml would look similar to the code below, please note the prerequisites that you have to enter manually. All services you want to use need to be listed here. There is also a reference to a component com.ibm.js.team.workitem.extension.component that is defined in its own plug-in. * The extension id is used to identify the operation participant to Jazz. Now we have the most important code for the plugin. You should be able to get it working. Please remember that there is few error handling at this point. You might want to enhance this.